We have great news for our members, subscribers, and all enthusiasts of naturalistic spirituality! 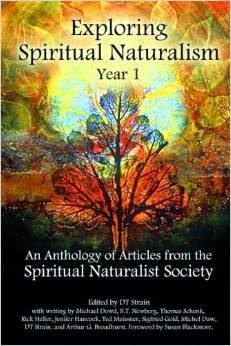 Articles from the first year of the Spiritual Naturalist Society have been brought together and organized by theme in this new anthology. Now the work of ten authors is available to the public, to Regular Members, and to Supporting Members, with a foreword by meme and consciousness researcher Susan Blackmore. Currently, the book can be purchased in print form or e-book now at Lulu.com (purchase links: paperback | E-book). In a few weeks processing will be complete and we expect the book to become available at Amazon.com and Barnes & Nobles website as well. Your purchase of the anthology goes to help support the mission and operations of the Spiritual Naturalist Society. 1) Always looking at things from the third-person; seeking ‘objective’ descriptions of everything, as though writing an anthropological research paper on it. This, as opposed to greater appreciation and immersion in first-person subjective experience. We cannot achieve greater subjective intuitive experience through greater objective intellectual knowledge alone. We are still holding on to the edge of the pool, scared to float. 2) An outward social/political focused agenda and perspective, as opposed to an inward-looking focus on personal growth and development (which, incidentally, helps give a firmer foundation to social efforts). 3) Talking/writing about the thing rather than putting it into practice (be it meditation or any other practice). 4) Appreciating the role of metaphor merely in an intellectual sense, without ever really moving one’s perspectives, responses, and feelings into that place. 5) Trying to approach the matter in a step by step process, whereby we: (a) note the claims, (b) assess them empirically, (c) decide if they have merit, (d) engage in them, and (e) reap the benefits. Where experiential cultivation practices are concerns, this algorithm will never get us there. We will eternally be stuck on stage (b) as many of us indeed are. In Buddhist practices, for example, we could be an expert in every character of the Pali Canon and more written over the centuries and this would not even constitute the first step. We will never reach a point where we have assessed the practices and decided they are worthy to be engaged in – not fully and not to the extent that matters. This is because they are inherently subjective experiences. The way you investigate them is by engaging in them without reservation. 6) The impulse to reject anything with the ‘taint’ of religion upon it, either because of ourselves or because of our fear others might think we are religious. 7) The effort to build something “alongside” or “other” than religion – instead of working to help the continued transformation of religion into a naturalistically compatible genuine path. This involves a completely bold and shameless use of their terms, imagery, practices, and manners of speech, whenever they are applicable – without apology. Not because of some effort to steal them – but because these terms convey honest feelings we have a right to and which illustrate the feelings we have about the awesomeness of reality. “a-” words and “non-” words and alternate clinical descriptions (alone) are – when it comes to the realm of spirituality – the *ghetto* of the English language, and we must aspire to better. 8) A continuous drive to debunk, critique, or complain about others’ beliefs – focusing on telling others what they ought to believe and do, rather than leading by living example. 9) A failure to appreciate or trust the full power of universal and unconditional love, forgiveness, and compassion; a generally harsh demeanor instead of loving-kindness, and an underestimating of the importance of such a demeanor to one’s well-being. Many of us rationalists, Humanists, etc. who aim to approach naturalistic spirituality sit against the wall at the dance, talking with one another about the dancers out on the floor. We analyze their movements and critique their techniques. Then we speculate about the biological underpinnings of their enjoyment of the dance. We might even present studies on the neural correlates of dancing. We imagine that this discussion and knowledge somehow gets us closer to being good dancers or to sharing in that enjoyment. Then the lights come on, the party is over, and we go home completely failing to have ever danced or even understood what the experience of dance is like or how it really feels. In the Houston chapter of the Spiritual Naturalist Society, we have covered topics like meditation, compassion, spiritual progress, awe/wonder, Taoism, Paganism, Buddhism, etc. I have found that many attendees love talking about “how it is” as if we are a bunch of aliens floating over planet earth, assessing the humans. But when I ask them to share their experiences, feelings, and how these practices affect their lives, I sense a resistance to ‘getting personal.’ The former kind of intellectualizing and rhetoric is not even a ‘lower level’ of spiritual practice – it is another kind of thing altogether, and will not be sufficient to the practitioner. There are other doors yet to be entered for many naturalists. And they must be if we are to truly heal the schism and reunite the natural and the sacred. This article is a paraphrase of comments originally left by the author at www.HumanisticPaganism.com. We’ve all been in frustrating situations such as standing in a long line in a crowded store, caught in highway traffic, and so on. I was in a crowded coffee shop recently. The teller at the register was stressed. The woman making the coffee was clearly upset that she was having to be so busy for so long, perhaps because they were overstaffed. When she called out the drinks that were ready, you could hear the annoyance in her voice. Many of the customers in line were pretty grim too. When I first entered the store and found my way into line, my initial reaction was to instinctively fall into a similar mode. However, I had fortunately been thinking recently about mindfulness and keeping perspective, so these thoughts were at the ready. I thought about the overall situation I was seeing, and the truth of it was easier by looking at the customers who had already picked up their coffees and were taking their first taste. The overall fact was this: I was in a place where all the people were there getting something they wanted or needed. The customers were all getting nice coffees of their own choosing to enjoy. And even the workers were working in a job that would give them pay they could use when they were off. Comparing this to the many places where people are starving, sick, dying, suffering from war and violence, and so on – it was clear that many places people would be overjoyed to have a job or have enough sustenance, let alone luxuries like flavored coffees. In actuality, by any objective measure, this was a place of pleasure and good fortune. We were all simply blind to the reality. Even if not everyone there fully appreciated how fortunate they were to be there, it didn’t change the fact that we were all very fortunate. We were people living in a society that allowed us to enjoy this simple pleasure, and everyone was walking out of there with the same benefit. With that in mind, I began to think about the exchange of pleasures and what a nice thing it was that all of these people were getting their little wishes fulfilled and needs met. But the tricky part is that that you have to feel for the other person picking up their coffee while you are still waiting in line. If you can associate yourself with them, you can feel happy for them – even if they themselves aren’t appreciating their situation. In a way, the fact that we often come to take these things for granted is a testament to our fortunate state. Think of them the way their mother might have thought of them while witnessing their child receiving a gift. We are all still those same children we were inside, even if the years may have added weight to our bodies and a lot of trivia and cynicism to our minds. If we can do this, then we may find a wonderful gift of our own in store. As it turns out, there are little pleasures all around us everyday. You might call this ambient pleasure. But you can harvest this pleasure by placing your sense of self within others. Now I no longer have to wait until I pick up my coffee. I can be pleasured the whole time I am in that environment, feeling happy for each person who gets their own as I see them blowing it with anticipation on their way out. And when I do get up to the register, the better I make the teller’s day, the more pleasure I can reap witnessing that too. Now, it would be a mistake to confuse mere pleasure for True Happiness, in the deepest sense of the word. But something wonderful happens in this kind of transfer. If I were to simply enjoy a transient pleasure of my own, that would be fine. But that kind of pleasure would be a fleeting thing, and a foolish foundation on which to base my contentment and flourishing in life. But when I feel happy for someone else enjoying a pleasure, this raw ore is smelted and refined into something more profound. Now it has been wrapped in empathy. As such, it has a character-molding effect on my psyche and mental habits. What was a simply mere pleasure for another has become an ego-liberating practice for me – and in that can be a part of the puzzle that is True Happiness. This is how we can harvest happiness from our surroundings everyday. Now, when we stand in lines our difficulties seem less so as we focus outward and see through scores of other eyes. As we wait for our turn, a smile creeps upon our face as we see others reach the end of their wait. This is one example of the bountiful crop that is simply not available to the selfish. Imagining experience from others’ point of view takes some mindfulness, careful observation, an active imagination, and contemplation. It also takes persistence and practice to internalize and cultivate this as a habit. But as we come to associate our lot with others’ evermore deeply, we begin to feel directly benefited and harmed when they are. And the motivation to be kind, compassionate, forgiving, and helpful is simply a natural and inevitable side effect. The following is a description of a ritual I have designed to precede and follow a meditation session, which I plan to use in my practice and would like to share. It can be conducted alone or in a group. Given it contains more elaborate steps than simple meditation, it may be suitable to perform once per week rather than with each meditation. Or, if a less frequent practice is preferred, it can be helpful to tie a ritual to a natural phenomena, such as the full and new moon, for example. This is a good way to symbolize our connection with the natural universe. The ritual itself is designed to help us keep in mind the role and function of meditation as a part of our larger practice. It’s themes illustrate how meditation ‘fits in’ to that practice. In so doing, the ritual ‘frames’ the meditation, both sequentially and conceptually. Like all ritual for Spiritual Naturalists, the outward procession of actions exists to help direct our inward attention and mental habits and perspectives. This is based on the confirmed knowledge that mental activity (memory, thought, emotion) and physical activity are intimately linked. On what you direct your inward mental attention during the various portions of this ritual is paramount. By themselves, the outward actions are meaningless. For this reason, keeping a highly directed focus during the ritual, and conducting the ritual habitually, will yield the best results (internalizing the concepts addressed in it). The symbolism, iconography, and metaphor used in this ritual appropriately come from the traditions and sources which inspire Spiritual Naturalist practice. In this case, they come from those cultural sources which inspire my particular blend of philosophies. This may be useful for others as is, but individual practitioners can also modify or design rituals to be more specific to the traditions that inform their practice. Before this ritual can be conducted, the practitioner will need either an altar, or something that fulfills a similar role. That is, a specific location and place-setting for working the ritual. At a minimum, this will be a place that can house the various artifacts needed in the ritual. They can be set up ahead of time, but it may be more convenient to have them set up in this place as an ongoing norm. Always having the altar present in the home may serve an additional reminder, not only to conduct the ritual, but a reminder of the concepts in the ritual. It is best to have it always arranged so that it is ready to conduct the ritual. For the altar itself, you can use a piece of furniture specifically built to be an altar, a makeshift altar, a shelf, or some other kind of focal point which can contain or hold the artifacts. A small cauldron or other bowl or stable container which can safely contain a fire (high temperatures). All of these items should be neatly arranged so they are easily accessible and do not require a lot of fidgeting to handle each of them. The cauldron should be kept with a small pile of salt inside (perhaps ¼ of the height), dry, and with its lid covering it. A flower can symbolize nature and/or impermanence. Fabrics or coverings which convey either simplicity, help define the space, or contain patterns which remind us of relevant concepts. Almost any other kinds of artifacts can be helpful. But the key is that they should mean something to you. Their ‘official’ connotation to some culture or in history is not important if the objects do not touch you in some manner. Sometimes, our knowledge of a cultural symbolism can be the thing that makes that object carry that meaning for us. Other times, there may be our own private symbols and metaphors which derive from our personal experience in life. If the objects help to keep your thoughts on the themes of the ritual and our practice, then they are helpful. If they don’t then they are extraneous and it is better to have simplicity. The pleasantness or unpleasantness of the artifacts is also irrelevant. The goal isn’t necessarily to decorate your altar in such a way to make you ‘feel nice’. Sometimes, a very pleasant object can be a distraction or encourage attachments. Meanwhile, an unpleasant object might remind us of impermanence, for example, and therefore be helpful. This can go either way. It is possible for artifacts to conjure up distracting ideas and thoughts contrary to the purposes of our ritual or practice, so putting thought into one’s altar is important. Before you begin the ritual, make sure that you are clean and ‘presentable’. A tuxedo or formal dress is not necessary. In fact, your clothes should be comfortable and non-distracting. But they should also not be dirty or ragged. Being clean and presentable underscores a level of respect for the process in which you are about to engage, and therefore for your practice. Again, inward disposition is paramount and it is how our disposition is affected by the act of cleaning ourselves up and putting on appropriate clothing that is of importance. Having little rules like, “I never conduct my ritual without having bathed in the morning” may seem arbitrary or baseless at first glance, but these are the kinds of things that help to cultivate mental attitudes that have profound effects on our life experience. Understanding these kinds of phenomena are key to understanding what Spiritual Naturalist practice is all about. Another part of preparation is making sure you have set aside the time for the ritual, in which you will not be distracted by interruptions. Make sure your phone is turned off or silent and no one will likely be entering the space who is not a participant in the ritual. Even before you are at your altar – perhaps even in another room or building. Consider your walk to where the ritual will be performed. If you are familiar with walking meditation, this is what you should engage in when proceeding to the location of the ritual. Basically, take each step mindfully and begin to turn your attention solely to that. Pay close attention to the touching of your foot to the ground, the feel as you shift your weight, and the lifting of the other foot. Try to put away all other distracting thoughts. As you make your way toward the altar in this fashion, this will be the first steps in moving your attention toward the ritual to follow. Once you reach the Altar, stop and bow deeply and slowly to it. At this time you will be bowing to whatever you have placed on your altar. In general, bowing to the altar is a time to turn your attention exclusively and wholly toward it and the purposes of the ritual. When it comes to the specific artifacts, you can choose to turn your attention toward one of them as you bow. For example, if you are a follower of Stoicism, and have a picture or statuette of its founder, Zeno, on your altar, you can focus on the statue as you bow. Meanwhile, your mental focus is on his teachings. At the time of the bow, you are saying to yourself (though not necessarily in mental words), “I am putting away all other thoughts and distractions and turning my attention to the teachings of my practice”. The outward act of bowing is an act of submission to the teachings, helping to set aside the ego and all other competition to our attention in this time. After you bow, sit carefully and deliberately at the altar, staying mindful of all your movements. This can be in cross-legged form or in a chair – however you plan to meditate. Purification is a common element of many traditional rituals. In Spiritual Naturalist practice, we attempt to purify the mind of distracting thoughts, and purify the heart of negative feelings that infringe upon our empathy. This can include feelings of guilt, fears and worries about things going on in our lives, anger or hostility toward others, impatience, anxiousness, and so on. The ritual cannot proceed successfully unless we first put away these distractions. This mental effort is accompanied by an outward activity that has traditionally been associated with purification in ancient Greek ceremony, and carried forward into the Christian tradition – and that involves water. Even in our minds today, water has the connotation of washing and makes a good parallel to the concept of purity in general. Side note: Although we are simply using any clean water source easiest for you to use, some may choose to prepare the water in an even more traditional sense. Ancient Greeks called water used in rituals khernips. This lustral water (holy water) was made by putting a flame out in it, and/or by placing dry verbena leaves into the water. In this case, you would also want to use either purified water, or sea water. Barley and Salt were also used in reference to purification. These details are not as important to me as what is done with the water in the ritual, but if holding to any of them help to give you a more sacred feeling as you perform the ritual, then feel free to follow this, or other traditional preparations. These are the words of Confucius as written by the Taoist philosopher, Chuang-Tzu (“In the World of Men”). The words refer to unifying your attention by purifying the mind of the distractions mentioned above – concerns of the ego. As you say these words and feel the water on your forehead, imagine all of these distractions dissipating from your mind and do not return to them for the remainder of the ritual and your meditation. Side note: There are many other kinds of purification rituals, such as burning sage for example. Because I am using fire for another purpose to follow, and because ancient Greeks used lustral water in their process (ancient Greek thought being a major part of my path), I have chosen to use water for purification. The first step in a journey is to light your path. Begin by removing the lid of the cauldron and carefully pouring the lighter fluid into the salt inside. It should be just deep enough that a small amount of the salt remains above the surface. Next, light a match and drop it into the cauldron. At this point the fire should ignite. The flame can be somewhat high so move your hand away immediately after dropping the match. Then take the incense stick, light it by holding it over the cauldron, blow the incense stick out, and place it in its holder as it continues to smoke. Smell is the sense most connected to our memory centers. For many people, incense is culturally associated with a sense of the sacred, which is what we are trying to elicit in ourselves. But beyond this, incense gives us the opportunity to create a distinct odor, which we can repeat each time we do the ritual. 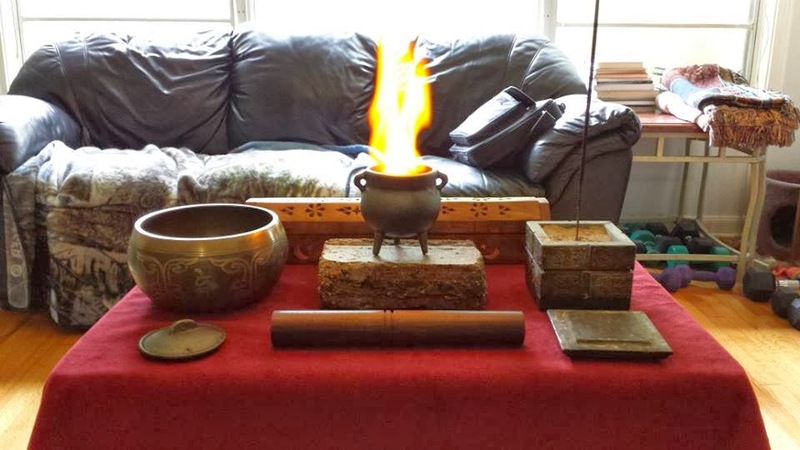 When we do this, it will trigger our memory and help us to return to the state of mind we were in when we last did the ritual (if you normally light incense outside the ritual, you may wish to select a special scent used only in this case). This is a response we can build over time that will help us become highly focused on the ritual’s concepts. You now have a smell-based trigger to help elicit a sense of the sacred and guide your focus more solidly to the ritual, as well as a flame upon which to focus. This is a paraphrase of the words of Heraclitus, taken from fragments DK B30, DK B90, and DK B66. It helps us to remember what the flame symbolizes – the impermanence and ever-changing and transforming nature of the universe. By internalizing this perspective over time, unhealthy attachment and short-sightedness are diminished. This diminishment will be touched upon in another phrase from Heraclitus to come later. To begin your meditation, ring the singing bowl three times. Be careful and deliberate in ringing the bowl, and wait with each ring until its sound has nearly diminished before the following ring. The bowl is rung three times to symbolize the three aspects of practice: motivation, wisdom, and practice – or, if you prefer: the heart, the head, and the hand. Other ways to phrase it are: perspectives, principles, and practices; or what I call the Primary Virtues: Compassion, Reason, and Discipline. These refer to pure motivation, wisdom and teachings, and putting them into practice. As the bowl chimes, focus all of your attention on the vibration of the sound. You have now put away language and labels. Try not to have any words or linguistic thoughts in your mind. Simply ‘be’ and experience. With the third chime, put down the ringer and go into your meditation posture, close your eyes, and begin meditation. For details on mindfulness meditation, see Meditation 101. You can also include loving-kindness meditation. If you are not being guided by another, you can use a phone or other timer to let you know when it is time to come out of meditation. This can be a chime similar to the bowl sound used in ritual. Or, you could set it on vibration under your hand. If you use this method, you should ring the bowl three times again to close out your meditation. This is the remainder of Heraclitus’ statement on the Divine Fire, taken from fragments DK B76 and DK B43. It refers to how everything in the universe is forever transforming, which the Buddhists call impermanence. And, with deep understanding of this, unhealthy attachment (wantonness) is extinguished. 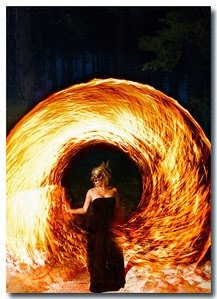 As you extinguish the fire, imagine letting go of clinging, graving, greed, and egotistical resistance to change. You have now completed the Meditation Framing & Procession Ritual. In addition to your meditation to increase mindfulness, you have dwelt upon those things of which we are to be mindful – those things which, if deeply grasped through mindfulness, have the potential to liberate us from anguish and bring flourishing. This includes appreciation of the cosmos as an ever-changing flux that makes all things of great importance to us (the sacred things) possible. With the frustrations of the ego set aside, room is made for compassion, which is simply the natural result of intimately knowing the interdependence of all things. If you are also practicing Journaling, then conducting this ritual in the morning, and reading last night’s journal entry at this time would be ideal. I would be interested to know what you think of this design, if you employ similar ritual in your practice, and any other comments or ideas you have along these lines! Our Education Director, B.T. Newberg, has published an article for us discussing the role of science in helping us find a Way of Life. So, I thought it would be fitting to cover the role of philosophy in our practice, as philosophy is something we discuss and write on a lot at the Society. Just the other day, I overheard a philosophy student at a local coffee shop conveying doubts to a friend about continuing to get a doctorate in philosophy. He said that many of the people in the philosophy department are simply not the kind of people he enjoys being around. He described them as pretentious, snobby, and so on. Now, of course, we cannot say all philosophy students, professors, or enthusiasts are like this, but this person’s perception was also not unheard of. This is because academic philosophy has, to a large extent, become an overly intellectualized, abstract, and often egotistical perversion of what philosophy was originally supposed to be about; at least if we go by what came out of Ancient Greece’s golden age of philosophy. I would venture to say that many writers and professors of philosophy, who are often called ‘philosophers’ do not actually fit the definition. In Socrates’ times, people who performed these services for money were called ‘sophists’ and received condemnation from the philosophers. However, it would not be practical or reasonable for us to condemn strictly academic philosophers of today in the same manner given the realities of our world. They, in fact, are doing noble work in education. But it is crucial to understand the important differences between the philosophy we often see expressed as an academic subject in our schools, and the applied living philosophy of the ancient philosophers. Most people know the word philosophy means “love of wisdom”. If we remember that wisdom is not the same as knowledge, then a philosopher is not someone who simply spouts off technical jargon and name-drops thinkers of the past. Rather, in essence, a philosopher is a person who asks, “what does it mean to be wise, and how can I be wiser?” More specifically, any time you are asking “what is?”, “what ought to be?” or “how do I know either?” you are doing philosophy, or some subset of it. More importantly, a philosopher is someone who does more than think and talk – opinions are a dime a dozen and matter little. But philosophers also act according to that wisdom and seek to make their lives a living example of it. Having a degree in philosophy from a university doesn’t make you a philosopher; nor does writing books, having a high IQ, or knowing a lot of trivia about philosophical history. Increased knowledge is bound to happen as we pursue wisdom and degrees can be one way to help with that. But it is the pursuing of wisdom and living a thoughtful, principled, consistent, and examined life that makes you a philosopher. In this sense, when philosophy is practiced as a lifestyle, it will intimately connect with our spirituality. If Spirituality is about focusing on the essential things in life in order to cultivate ourselves for greater flourishing, then this cannot be done without sound and consistent philosophy. This is why traditions such as Stoicism and Buddhism are both philosophies, as well as religious and spiritual paths. With a sound philosophical underpinning, our practices make sense – connecting our understanding of the world with how we live in it, and providing the rationale behind that system of practice and the goal it is designed to achieve. One might say philosophy is the blueprint, spiritual practice is the construction, a life well lived is the building, and flourishing is the home – and all of this is of what our spirituality consists. (cc) Chriss Knisley (cknisley44), Flickr.com. But I’m going against my usual aversion to negative terms in the title of this article because, in this case, lack of theism is of relevance. I intend to make a case for Thanksgiving, not only as a personal practice, but as a social institution – something that may be surprising to hear coming from an atheist. By “Thanksgiving” I do not refer merely to that custom of coming together to feast on Turkey with friends and family, or to that particular history regarding pilgrims in the ‘new world’. What I’m really talking about is a special time of year to remind ourselves to be thankful – an internal disposition. At the Spiritual Naturalist Society, we often talk about the meaning and value of ritual for naturalists and it comes down to the importance of what’s going on mentally as you perform those outward actions. Although thankfulness is an internal disposition, that disposition can be encouraged and cultivated by our outward actions, traditionalized and shared in community. But why be thankful, and to whom? It’s true that for naturalists like myself, we don’t believe there is an all-powerful entity somewhere who took conscious action on our behalf, and to be thankful toward. But certainly being thankful to other people for what they have done for us and what they mean to our lives has obvious benefits and ethical value in itself. We can be thankful to our family, to our friends, our teachers and mentors, and to people we don’t even know who have lent to the benefits we enjoy. This includes the workers who grew and delivered our food, the scientists who furthered our knowledge, the artists who inspired us, the visionaries who showed our society new paths, the entrepreneurs who keep our economy diverse, the people who risk their lives to keep us safe, the leaders who provide excellent management, the ethical teachers (activists, philosophers, religious) who help our society improve, the good parents who raise all of these kinds of people, and the most unfortunate who give us the privilege of helping. Beyond that, however, there are the benefits of a general attitude of gratefulness – a general appreciation for the good experiences in our lives, whether the result of agency or not. In 2002 McCullough and Tsang at Southern Methodist University and Emmons at University of California showed that attitudes of higher gratitude improved well-being and prosocial behaviors while reducing envy and economic materialism (study link). In 2006 Kashdan, Uswatte, and Julian of George Mason University showed that gratitude helped veterans with PTSD and lent to a flourishing (eudaimonic) life (study link) – one of the very things the Spiritual Naturalist Society works to promote for its subscribers and members. In 2008 Wood, Joseph, Maltby of the Universities of Warwick, Nottingham, and Leicester respectively, showed that higher gratitude improves satisfaction in life and that such people were “more open… conscientious, and less neurotic” (study link). Many more studies of this nature have taken place over the years and continue today. There has been a growing controversy over businesses being open on Thanksgiving, and black Friday being extended into the time of the holiday. This makes it more difficult for workers to practice Thanksgiving and so on. While Thanksgiving also has religious meaning to many, I think I have made the case for the benefits of Thanksgiving in helping to cultivate a quality that has secular benefit, and is therefore a benefit to society. We generally do not write on social or political issues at the Spiritual Naturalist Society, but I would suggest that we ought to try to preserve Thanksgiving as a special day and help others do the same. What we do focus on in our group is promoting practices that provide personal cultivation of qualities that make for a flourishing life. And, as it happens, those practices include rituals that are often most effective when communal. While private businesses should be free to make their own choices, we can help preserve Thanksgiving by refusing to do that black Friday shopping on Thanksgiving. And, for the sake of others if not ourselves, we can ask our businesses not to be open on that day. Not all atheists will agree with this, of course, but many who are also Spiritual Naturalists might, like myself, see that there is a benefit to having certain sacred times we recognize as a society. But, aside from that social issue, what is most important is cultivating that internal disposition of gratitude through appreciation of the ‘big picture’. In this way, Thanksgiving will always be preserved. Thanks to Wikipedia for help in finding references given in this article. Hello friends! 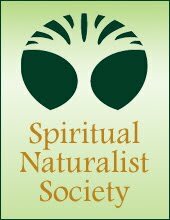 Today (September 18, 2013) marks one year since the Spiritual Naturalist Society officially launched. We have come a long way in a short time and I am so thankful for the many people who have given their enthusiastic support to the Society; either with their involvement on the Advisory Board, their presence on the staff, their work as local organizers, their writing, their contributions to the Society archives, or of course, with their supporting membership. It was about a year before our launch, in 2011, that preparations began on forming the Society. The growing number of people looking for a spiritual practice that was consistent with a rational naturalistic view of the world was undeniable. There seemed to be no other organization and community that focused on compassion, practice, ritual, and inner development while at the same time maintaining a clear standard of humility in our approach to knowledge and claims. Some existing groups were either so open that supernaturalism, the paranormal, pseudoscience, and faith-based approaches were also included. Other groups held to rational, empirical, and naturalistic standards, but were focused more on academic or technical materials, or they were focused on the culture wars and politics. What was needed was a community support and resource organization that was specifically for naturalists and specifically aimed at positive, compassionate, uplifting, and informative content for daily living and personal practice as a naturalist. Over that year of preparation, the general mission and structure of the Society was designed, along with the extensive work needed to establish the website and its functions. We reached out to just about every prominent name in Spiritual Naturalism and Religious Naturalism – getting moral support and participation. By September we were ready to launch with a good enthusiastic response from many people. Our connections on social networks grew and I met so many wonderful people with talents and ideas and a willingness to lend a hand. Just one month after launch and we already had a second local chapter getting started. Our member archives already consisted of more than 100,000 words (about the equivalent of a 400 page book), and we were adding more material to them each month. We also started syndicating our articles on Patheos.com and had a member text chat up and running. Two more local chapters formed the following month. In January we got a new tool – our own internal private social network for members. We founded yet another local chapter and we established our Compassion Fund, which is still helping those in need today. February marked the first month the Society was able to pay all of its own bills. We added another local chapter and a new multimedia page. In March we got our first ad in the Shambhala Sun, and in April we partnered with the Charter for Compassion and offered our first discount to members for a Humanist course by Jennifer Hancock. In May we gained our first local chapter outside the United States, and in June our 501(c)3 status was finally approved and back-dated to March of 2012. In July we published our Statement on Principles, outlining the principles by which we operate as an organization, and for which we stand. While many volunteers had been contributing in various spontaneous ways, in August we established a full regular volunteer staff with several key positions filled. This will allow the Society to do even more simultaneously going forward. Over this first year, we have also added over 50 additional articles, videos, podcasts, poems, and artworks to our educational and inspirational archives for members. Over 65,500 people have come to our website, with 3,000 more visiting us each month. We have over 3,700 Facebook fans which allow our articles and posts to often reach as many as 50,000 more people. We also have over 460 people signed up to our 7 local chapters and all of these figures continue to grow. And soon we will be expanding our membership concept to include a free membership option, which will invite even more people to become a part of our community. But what is more important than the numbers is how this has helped us to fulfill our mission of making more people aware of a viable path toward greater happiness in a naturalistic spirituality – and, how many people I have heard from who have been helped or inspired by our messages. We are also starting to see new friendships form as our member community grows! That is why I’m also happy to announce that we will soon be getting a new video chat tool that will allow for greater interaction among members, better staff coordination, and be a better tool for a Spiritual Naturalism course we are currently designing. And this month, in celebration of our anniversary, we will be publishing an anthology of our articles over the past year. It will be available in paperback or e-book format through amazon.com and our own website, so keep an eye out for that! If you are not yet a member of the Society, I ask you to consider membership. You can learn more at this link. You can also subscribe to our articles and let others know about us. Thanks for your kind support of the Society over this year. With your help it will be exciting to see what the next year in Spiritual Naturalism brings! (cc) Angela Marie Henriette, Flickr.com. We are at the beginning of an important movement to gather again, a spirituality that is fully natural and rational, yet not shallow or merely technical and descriptive – one that engages all of what it means to be a full and complete human being; not merely an intellectual exercise. Within Spiritual Naturalism, or Religious Naturalism, there are numerous emerging books and articles from a variety of backgrounds. We begin, first, with the entire goal of our effort: happiness. Or, the answer to the question as the ancient Greeks put it, “What is the best way to live?” The human being is a natural entity – a part of Nature and with its own objective nature, living in an objective environment. This is a world of consequences. Therefore, how best to live is a matter of engineering. That is, the engineering of our subjective experience, our habits, our character, and our life so as to yield happiness. By happiness we mean, not mere pleasure or circumstantial delight. This has proven to be a poor predictor of well being or happiness. Rather, we mean a deep sense of inner peace and joy – a happiness that is not contingent upon the vicissitudes of external conditions but also inspires an engaged good life, in both senses of the word. We might call this True Happiness to delineate between it and the shallow forms of fleeting happiness with which many confuse it. This kind of happiness is difficult if not impossible with the ‘default character’ that tends to emerge without a focused spiritual practice, or some de facto approximation of one. Normally, we are plagued with fear, greed, regret, anger, jealousy, concerns about what others think of us, and so on. These not only infringe on our happiness directly, but they encourage further behaviors and habits that are contrary to it. Such beings, unable to approach True Happiness, cling to the closest thing they can approach – pleasure derived from possessions, relationships, status, reputation, money, and so on. Yet, these are impermanent and shaky things on which to base one’s happiness. Disappointment and suffering are inevitable. So, for a naturalist, a sensible spiritual practice will be a system by which we achieve character transformation. Perfection in this is unlikely, but the degree to which we can transform ourselves will yield a similar degree of freedom from that egotistical outlook and corresponding levels of True Happiness in life. Further, the practitioner may find that the degree of transformation possible in the human character can be astonishing. How is such character transformation achieved? Experience will tell us that a few things are certain: reading is not enough, knowledge is not enough, intellectual assent (agreement) to even the best wisdom is not enough. You have read many wise things, and dutifully shared them (along with pretty pictures of sunsets) on social media, email, or in conversations with your friends. Yet you have found yourself acting in discord with them time and again when the rubber meets the road. You “know better” but knowing better is not enough. If you were truly enlightened, your character would be such that it would automatically and naturally react to real life situations in accord with the best wisdom you have read. There is no number of internet posts you can share or ‘like’ that will get you to this place. But this is what our spiritual practice should be designed to achieve. Rather, practice means engaging in practices and rituals designed to reformat your thought and judgment process, altering your inner value system. The key to understanding how and why these practices and rituals work, is getting over your dismissal of the subjective. Society has told you the subjective is ‘less real’ or ‘matters less’ than the objective. Yet, our very goal – happiness – is a subjective state. Therefore subjective things matter; things like: the language we use to describe and frame things, the categories we use, our perspectives on Nature and our place in it, simple outward movements and poses of reverence, how we feel about things, our speech and mannerism. For many, this may seem obvious, but for many naturalists, we are used to looking at the world scientifically and therefore tend to find comfort and refuge in highly technical and impersonal descriptions. Yet, one of the core aspects of Spiritual Naturalism is that we can have a role for good, solid, science – and – inner beauty with a sense of the sacred. One need not contradict or betray the other. In these practices and rituals, we open both our thoughts and our feelings. We use metaphor, poetry, art, iconography, music, dance and other movement, and more. We use these because our minds have multiple ways of approaching the world. It is by a distributed connection to the deeper truths of wise teachings that all of these aspects of our natural soul are touched. And, in that multi-sensory and emotional/intellectual mixture, they become an increasingly deeper part of our way of looking at the world. Here, intellectual knowledge becomes intuitive. Character is transformed such that ‘ways of living’ becomes ‘ways of being’. This is a path of continuous epiphany, profound experience, and deeper understanding. But to engage in such a practice requires a few things. For one, it requires the naturalist to give up any deep seated animosity and resistance to anything with the tinge of sounding too religious. This means not caring if others might misunderstand and think we have given up reason. It also means having the confidence that it is possible to set aside the ‘culture war’ against religion in our hearts but still be able to act in the world against ignorance, intolerance, and improper religious political actions. Another thing this path requires is the willingness to change our life – you know, that thing that goes on when you finish reading this article and get up from the computer. It means doing something different when you wake up in the morning than you did before; and sticking with it. It means actually driving to new places, possibly bowing, ringing bells, lighting candles, vocalizing ritually, and so on. Many will read this and agree with it, but then their minds will resist change and quickly convince them that the answer is to click onward to read more things – as if that’s the next step. But you will never reach a point where you have read enough, fully understand, and then are ready to engage in practice. If that is your process, you will die having only read. So, as a system, this begins with the basic facts provided to us by reason. And, by reason, I mean that we believe knowledge comes to us through observation and what we can infer rationally from those observations. We are limited in our ability to know all things. This process includes science, but also the use of reason in our own lives, and most importantly – humility. That is, a humble approach to knowledge and the claims we make. In addition, humility in the sense that I focus on what I believe rather than worrying so much about telling others what they ought to believe. But these facts about the world and ourselves are just the beginning of wisdom, not the end. From here, what is important is our perspective on those facts. Often, people point out that something is a ‘value judgment’ as a way of dismissing it. But value judgments are what we must make. They are critical. And, getting them right is critical to our happiness. Yes, there are correct and incorrect value judgments; at least within such a system. We can say they are correct if they fulfill the purpose of humans making value judgments. In other words, if these judgments guide us toward positive thoughts and actions which are really conducive to a good life, then they are correct because they are consistent with their purpose. For example, science will tell us there is a glass, and half of its inner volume is occupied by dihydrogen monoxide. We can look at that glass of water and we can judge that it is half empty or half full. This is the difference between a claim and a perspective. One of the ‘advances’ of naturalistic spirituality is that we do not use our spirituality to make claims or rest parts of our spirituality upon those claims. Unlike some belief systems which get their facts from faith or revelation or scripture, we leave fact finding to those who are putting in the hard work of observing and recording them. But perspectives on those facts is where philosophy and our spirituality pick up. In this way, our spirituality is not opposed to science. Nor are the two “non-overlapping magisteria”. Instead, science has become a respected and functional department within our spirituality, with no need to put words in its mouth or corrupt the purity of its method. Now, to the strict intellectual/skeptical naturalist, the question of whether the glass is half full or half empty is just a silly little word game and the terms are interchangeable and of little consequence. But another of the crucial realizations of Spiritual Naturalism is this: the difference is monumental. This principle, extrapolated to the rest of our life, can be the distinction between two people in the same external circumstances – one with a full and happy life, and the other ending it in suicide. When we come to terms with the significance of our conceptualizations and judgments, the rest of spiritual practice begins to make functional sense – from meditation, to ritual, to all of the other many practices, sacred language, and more. As we build habits of value judgment through various practices, and find new perceptions of wise teachings through rituals designed to elicit epiphany and peak experience, our baseline responses will begin to shift. That deep perspective shift includes the little often subconscious judgments we make and the emotional responses that kick in following those judgments. There has been a wealth of wisdom developed along these lines, going back to Taoism and Buddhism in the East, and Stoicism and Epicureanism in the West, and many others. But, again, putting that wisdom into practice is when the process begins. Now that you’ve reached the end of this article, what you do in your life is what will make the difference. The best mask in the world will not bring true happiness. (cc) Ann (Mrs Magic), Flickr.com. The more I’ve learned about naturalistic spirituality and spiritual practice, the more I’ve come to regard ethics as irrelevant – and the more ethical I’ve become. It has been common to look at ethics as a set of rules. More importantly, a set of rules regarding your behavior; what you say, what you do, how you treat others, and so on. More elaborate moral theories have described the basis on which evaluations are made – how you can ‘compute’ what is ethical and what isn’t. If this rule-based system of external behaviors is what is meant by ethics, then the spiritual practitioner has no use for them. They are not merely irrelevant, but actually harmful and misguided. If, on the other hand, our idea of ethics has to do with wise practices for living well, then it becomes clear that not only are these crucial, but they are ubiquitous. By this sense of the word, there is nothing that is not an ethical matter. But in order for this path to be clear, one must understand first that the wise and the virtuous are synonymous, and secondly, that external actions and behaviors are the end – not the beginning. The focus of naturalistic spiritual practice is inner transformation. With the recognition that all things are ever-changing comes the understanding that ‘who you are can be’ as a person is boundless. I suspect that if we understood the lengths to which a human psyche can be conditioned, we would be shocked. We get glimpses of this shock when we witness occasional human extremes, in cases of both the physical and the mental. For example, when we witness an athlete perform some amazing feat that pushes the envelope of what we thought possible – or, when we see a display of remarkable mercy and forgiveness toward a person who had done something so horrible we can hardly grasp the inner workings of the forgiver. But we need not be transformed to the absolute edge of human potential in order to see our lives markedly improved. Incremental growth through continued practice can cultivate the qualities necessary to be happier in life. A true, deep, happiness is our aim. But happiness is a subjective internal state. As such, when we take the latter understanding of ethics described above, we must understand that our practice begins within. It begins with our deepest perception of ourselves and our world. We first act to condition our perspectives, our judgments, our value system, and our motivation. Of course, we have all heard and know well things like, “I should be more forgiving”, “I should be patient”, “I should be loving”, and so on. But many of us don’t know what to do to make it so. We simply repeat it like a mantra while hitting ourselves over the head – as though we could bash these qualities into our brains! But this does not work; and worse, alongside follows feelings of guilt or shame – also unnecessary and harmful to our progress. This common frustration flows from two problems: (1) a failure to completely discard forever old notions of ethics as external, authoritarian reward/punishment rule systems, and (2) a lack of understanding of the purpose and function of spiritual practice. That second one is endemic to Western cultures in particular. While there certainly are traditions of practice in Western philosophies and religions, many of our modern expressions of Christianity (the dominant religion) focus highly on what dogmas/beliefs/worldviews the adherent has accepted, believed, and proclaimed. This is seen as the most important thing which makes one a Christian. This concept exists in other traditions as well. Even in Humanism – for which I left Christianity and which I still consider myself – we all too often look at “what makes you a Humanist” to be assent to a list of principles as outlined in the latest Humanist Manifesto. We too are still affected by that old belief-based approach. Unfortunately, what gets lost in this view is the idea of a life practice. Without a robust practice, we cannot make progress in our self development, and all of these principles and dogmas merely become ‘teams’ of people waving their own flags in loyalty to one side or another. Participation in this kind of environment cannot produce compassion, love, understanding, wisdom, or happiness. So, if we cannot transform ourselves by bashing ourselves over the head repeatedly, then how can we become the kind of person we want to become – the kind of person who can enjoy a truer, deeper, contentment and happiness in life? We must recognize that it is not about forcing ourselves into certain external behaviors, talk, or actions. Most people recognize that if you were to strap a person into a mechanical frame and force their body into doing things – whether horrible things or wonderful things – that it would be silly to praise or blame that person. Likewise, the outward actions we perform while puppeted, even by ourselves, is similarly of little value. If I am angry with someone for what they have done but, because I’ve been told that I should be forgiving, force myself to smile and tell them I forgive them while biting my tongue, then I have done nothing noble. I may have done something clever and political, in that people may think I am forgiving, but this is no more enlightened that a cat burglar covering his tracks. And yet, my message still isn’t that “you have been bad”! That would be that old authoritarian view that must be unlearned. Rather, the reason you don’t want to be this way is because you are harming yourself. I have a business with some partners and just yesterday we were talking about how we wanted to treat our clients and customers like family – to really think on their behalf and work for them as we would do the job if a family member had come in. I pointed out that in a previous job I had worked at, it was very common for the workers to hate the customers and bash them in private, and then smile and behave nicely to their face. We have all come to expect that, when we are told “have a nice day” in most stores, the person saying it probably could care less and are simply doing what their boss wants them to do. But the real tragedy in this is not for the customer who is hardly affected, but for the worker. With a different outlook, and some genuine feelings of caring for others, they would have a much brighter experience in their job. Their heart would be lifted of the extra stress and bitterness bottled up inside. The little things that the customer did that were annoying wouldn’t be as big of a deal if we had affection for them. So, my partners and I agreed, our aim is to do more than treat our customers like family – but to really try to cultivate deep within ourselves real feelings of familial love and concern for them. Because happiness is a subjective state, we cannot achieve it with an attitude that the ‘objective is real’ and the ‘subjective doesn’t matter’. To achieve real happiness requires that we pay attention to the subjective because it matters. Given the same exact objective conditions, the subjective can make the difference between a long happy life, and suicide – literally life and death. That’s how much the subjective matters. Even in less extreme examples, a low level of dissatisfaction can hamper life quality severely. Focusing on the subjective, in this case, means taking a look at how we frame things. What labels to we use, how do we categorize things, what kinds of judgments do we make about things – what is our value system? Don’t try to control, ignore, or bottle up your emotions (that can be harmful and feeling guilty about your feelings is just that old useless authoritarianism popping up again). Instead, rethink the way you look at the world. This is where the wisdom teachings of many traditions come in. Philosophies like Taoism, Buddhism, and Stoicism (my favorites) have very specific ways of describing perspectives on life, the universe, and our values. Once you have learned and assented to these ways of framing the world, you have taken the first step. Over time, as you act in accord with these ways of thinking and run through what you think about things as real life situations arise, your thinking habits will build and your perspectives will begin to shift – with them, your value systems, and with those, your emotions will flow naturally and healthily in a way that is more in line with your reality and conducive to your happiness. It is this slow cultivation of thinking habits and perspective over time that makes the difference – not merely reading some philosophy and agreeing with it. But to stay in this frame of mind as the days events transpire, takes greater powers of focus and attention than a person typically has without training. You need this to stay aware of what you have learned, to apply its wisdom to your current situation in the heat of the moment, and to watch your own subtle reactions before and during their arising. Otherwise, you will get swept up in the moment and your old deeply engrained value system will take over. This underscores the central importance of mindfulness meditation and hopefully makes clear one of its more basic functions in one’s overall practice. So, whenever you think about how you’d like to have acted or what kind of person you want to be, don’t remind yourself to behave a certain way. Instead, remind yourself of your new perspectives and values, and your heart will follow. With pure motivation, outward behavior will flow naturally.